Balloon pulmonary angioplasty (BPA) has emerged as an effective treatment for patients with inoperable chronic thromboembolic pulmonary hypertension (CTEPH). Renal function has been identified as a prognostic marker in patients with pulmonary hypertension in previous studies. We, therefore, aimed to investigate the clinical parameters associated with improvements in renal function in patients with CTEPH. A total of 45 consecutive patients with inoperable CTEPH undergoing BPA (mean age 62.2 ± 15.1 years) were included in the study. 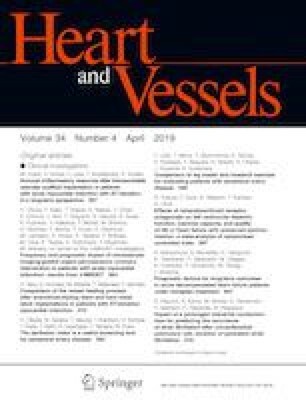 We evaluated the patients’ clinical characteristics at baseline and at 1-year post-BPA, and investigated the association between renal function and hemodynamic parameters, including right heart function. Hemodynamics and renal function showed sustained improvements at 1 year after BPA in 64.4% of patients. Improved estimated glomerular filtration rate (eGFR) was significantly correlated with increased cardiac index (r = 0.433, p = 0.003) and mixed venous oxygen saturation (SvO2; r = 0.459, p = 0.002), and with decreased mean pulmonary arterial pressure (r = − 0.420, p = 0.004) and pulmonary vascular resistance (r = -− 0.465, p = 0.001). Multivariate analysis revealed that an increase in SvO2 immediately after the final BPA was associated with improved eGFR after the 1st year (odds ratio 1.041; 95% confidence interval 1.004–1.078; P = 0.027). The cut-off value for predicting improved eGFR was an increase in SvO2 after the final BPA of >125.4% over the baseline value (specificity 100%, sensitivity 24.1%). In conclusion, BPA improved symptoms, right heart function, hemodynamics, and renal function up to the chronic phase. Increasing SvO2 by >125.4% above baseline in the acute phase is important for improving renal function at 1 year after BPA in CTEPH patients. We thank Jane Charbonneau, DVM, and Susan Furness, PhD, from Edanz Group (https://www.edanzediting.com/ac) for editing drafts of this manuscript.